The Westside Board of Education has voted unanimously to approve a concept design for Prairie Lane Elementary School. As part of our 2015 Facilities Master Plan, Prairie Lane will undergo extensive renovations and expansion, with construction beginning the Summer of 2019. 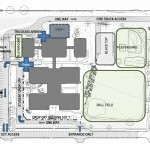 Click here to view the concept design for Prairie Lane Elementary School. TACKArchitects and Project Advocates facilitated the presentation, after gathering community input on wants and needs for the project. The Design Advisory Committee will continue to meet throughout this fall. Construction is set to begin in Summer of 2019. Swanson Elementary is a buzz of activity. Structural Steel is being erected in the classroom wing, work on exterior metal framing continues, and mechanical, electrical and plumbing rough-ins are ongoing. Crews are installing exterior brick on the north side, concrete slabs are being poured and underground utilities have begun. Activity at Westbrook Elementary continues through the construction on a new Westside Boys & Girls Club. Masonry walls are being erected, exterior waterproofing is being installed, drain tile work is ongoing, and underground sanitary sewer lines are being installed on the west side of the site. Work on the storm sewer and water lines will begin in the next few weeks. Thank you to all who attended our Open House on October 8! Check back for a slideshow of photos from the event, showcasing this newly renovated and expanded building.